Both seasonal and interannual dynamics of LAI are characteristic of ecosystems, and seasonal dynamics of LAI is one of the aspects of phenology and life form. Evergreen versus broadleaved forests exhibit contrasting seasonal progression of LAI, with seasonal variation of less than 10% of LAI for evergreen. LAI expansion in deciduous species occurs within 1 month from budburst to maximum LAI which remains quite constant over the growing season and then decreases at leaf fall. On an interannual time basis, adjusting LAI is a response of the ecosystem to cope with drought. Over a large range of climates, changes in LAI have been studied at both the individual and ecosystem scales along gradients from higher to lower rainfall amounts or from moister to drier habitats in broad- or needle-leaved tree or shrub communities. The control of LAI and morphology is often the most powerful means that a mesophytic plant has to influence its fate when subjected to long-term water stress in the field. The main response of the shrubs to different precipitation regimes in the chaparral range is to change LAI, and not physiological parameters like stomatal regulation. This adjustment is largely species dependent and both leaf size and number are affected. For example, mature eucalyptus trees are tall and produce large leaves at moist sites, whereas at drier sites, trees are shorter and tend to produce smaller leaves. 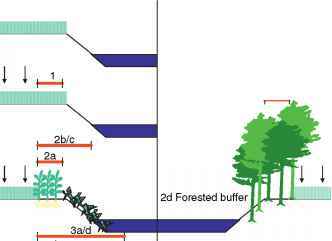 Aging of forest stands also leads to temporal changes in LAI. LAI firstly increases to a maximum at ages ranging from 16 to 50 (depending on species and site index) and subsequently stabilises or declines slightly, up to 20% lower than peak value. Interestingly, aboveground net primary production follows a similar trend with aging.